(Macao, Nov. 19, 2018) – Sands China Ltd. honoured the second group of team members to complete the innovative Sands China International Strategic Leadership Programme for Integrated Resorts with a graduation ceremony Friday at Sands® Cotai Central. The programme is the first of its kind aimed at developing leaders in integrated resort management. A group of 26 Sands China management team members developed their leadership skills over the last five months through coursework at three prestigious universities on three continents. Participants benefit from the unique areas of industry expertise of each educational institution: the Católica Lisbon School of Business & Economics in Lisbon, Portugal; Cornell School of Hotel Administration in Ithaca, New York, USA; and the University of Saint Joseph in Macao. Special guests attending the graduation were Rector of the University of Saint Joseph Fr. Peter Stilwell; Senior Associate Dean for Research of the Católica Lisbon School of Business & Economics Prof. David Patient; Dr. Wilfred Wong; and other Sands China executives. As was the format last year, the programme’s coursework comprises both lectures and a practical component in the form of a business challenge. 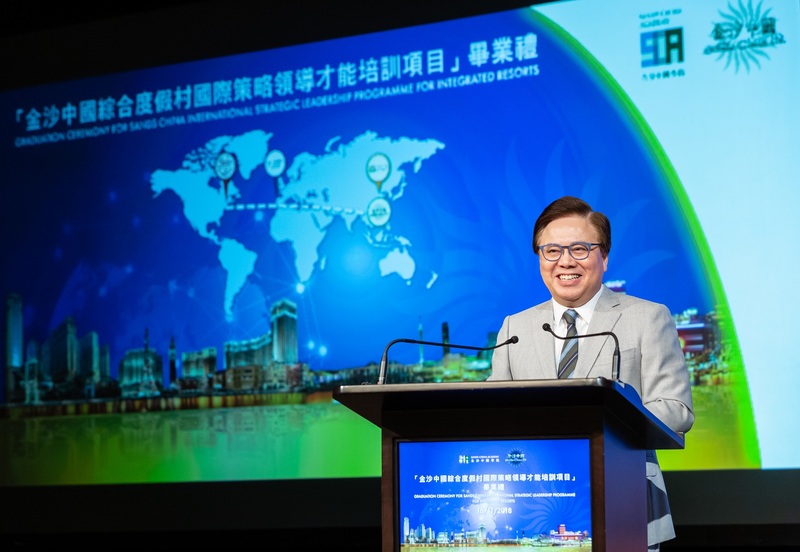 Challenge topics are designed by members of Sands China’s executive committee in consideration of the real-world business situations of the company and the future development of Macao. To complete the challenges, participants must make use of both the business insights gained through their integrated resort work experience and their understanding of industry trends and regional development. The strategic thinking developed over the five-month programme is essential for participants to complete their task: developing and presenting a set of recommendations to Sands China senior executives before the graduation ceremony. The Sands China International Strategic Leadership Programme for Integrated Resorts offers international horizons for around two dozen potential future leaders each year. The customised programme is the latest initiative of the Sands China Academy, and was specially designed in conjunction with Católica Lisbon, Cornell University and the University of Saint Joseph in order to develop local leaders in integrated resort management. 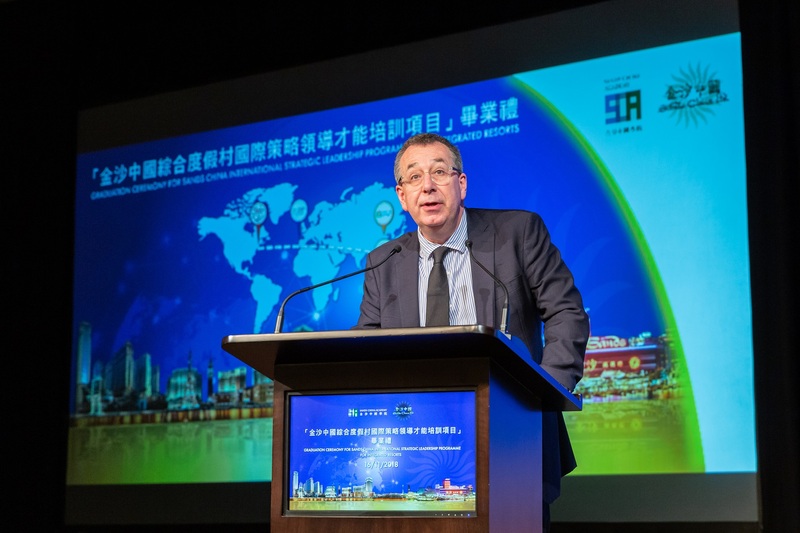 Photo caption: Dr. Wilfred Wong (left), president of Sands China Ltd., and Professor David Patient (right), senior associate dean for research of Católica Lisbon School of Business & Economics, address graduates and audience members during a Nov. 16 graduation ceremony at Sands Cotai Central for the Sands China International Strategic Leadership Programme for Integrated Resorts. The programme sent a group of 26 Sands China local management team members to three universities on three continents over five months to develop their leadership skills. Photo caption: Graduates and guests of honour attend the Nov. 16 graduation ceremony at Sands Cotai Central for the Sands China International Strategic Leadership Programme for Integrated Resorts. Programme participants had to develop and present a set of recommendations to Sands China senior executives that addressed the company’s real-life business challenges.